One frustrating aspect of Halloween in Los Angeles is that most attractions are open weekends only, making it difficult if not impossible for even a determined haunt-hunter to reach all his targets. Fortunately, if you are seeking paranormal activity during the week, there are a handful of yard haunt displays open nightly, fully decorated, with lights on and sound effects wailing. 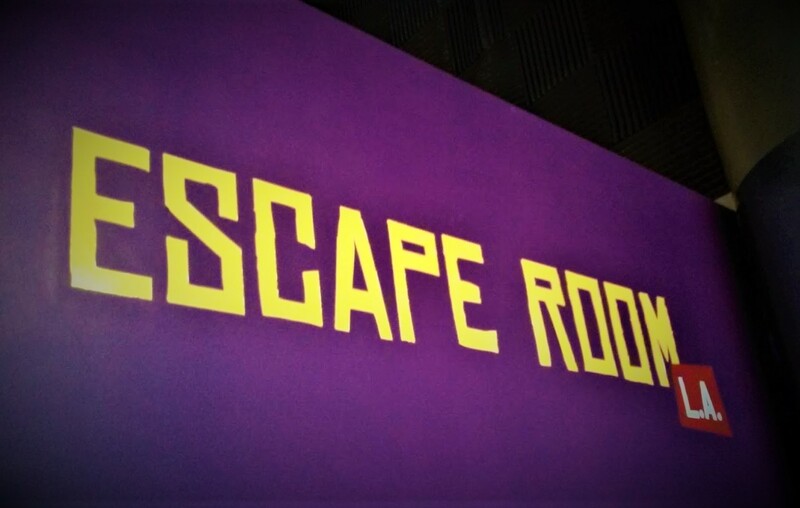 Some of these may have more elaborate activity later in the month, and of course none of them will be open for trick-or-treating until October 31, but all of them offer an opportunity to get your Halloween fix before the weekend rolls around. 6-10pm on Fridays and Saturdays. 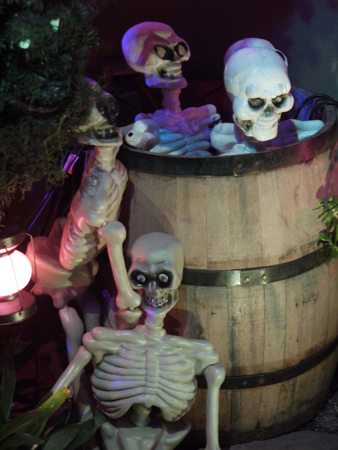 Description: The Boney Island yard haunt opens for another season of Halloween fun for the whole family. This is a true yard haunt - as opposed to a haunted house - with decorations and displays, silly sight gags, and humorous antics. There are no actors in costumes, only mechanized props, skeletons, and special effects. As always, Boney Island is free. On Halloween Night, the haunt becomes more festive, with live monsters roaming the sidewalk. Trick-or-treaters seeking candy will not have to endure a walk-through maze but they will have to brave a path through the skeletons, and if memory serves there is a coffin near the front door that delivers a surprise jolt. Halloween 2013's Grave Rock Gulch has gone to the grave, replaced by a more traditional haunted house theme, featuring an incredibly impressive facade that looks like the genuine article. Lighted Jack O'Lanterns dot the porch, and skeletons push curtains open to peer out of windows with rattling shutters. A weather vane spins erratically on the roof. Invisible ghosts manifest outside, rocking an empty chair and rattling a trash bin. A leaves atop a grave roil with the movement of something underneath - attempting to get out, and a victim lies face down, head inside a basement window, legs kicking helplessly. 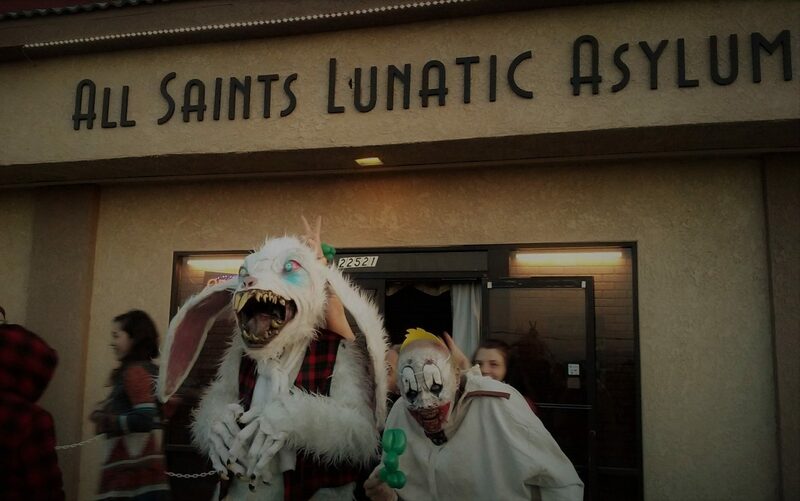 Hollywood Haunter's A Night in a Haunted House is currently in full swing, from sundown to 7pm nightly. Candy and treats will be available on Halloween Night, starting at 6pm; perhaps an extra spook or two will appear. Hollywood Haunter is collecting non-perishable food donations for the Burbank Temporary Aid Center. Stop by any time in October to drop of a canned food item or similar. Note: The neighbors are getting into the act as well. The two adjacent houses are also decorated, and one of them is haunted by a masked figure, who may be a mannequin or a living being - you never know for sure. 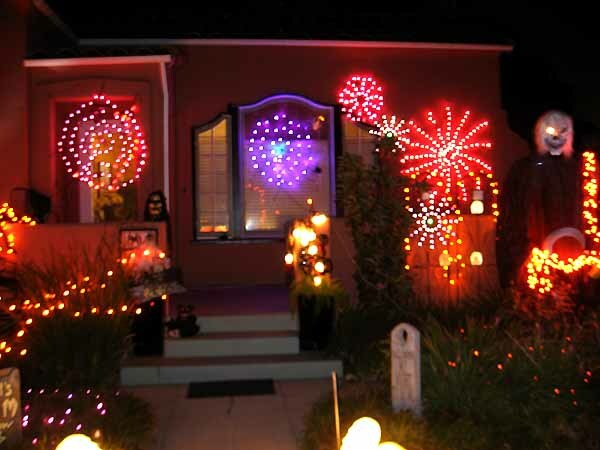 This decorated yard haunt materializes all month long, from October 1 through Halloween Night. 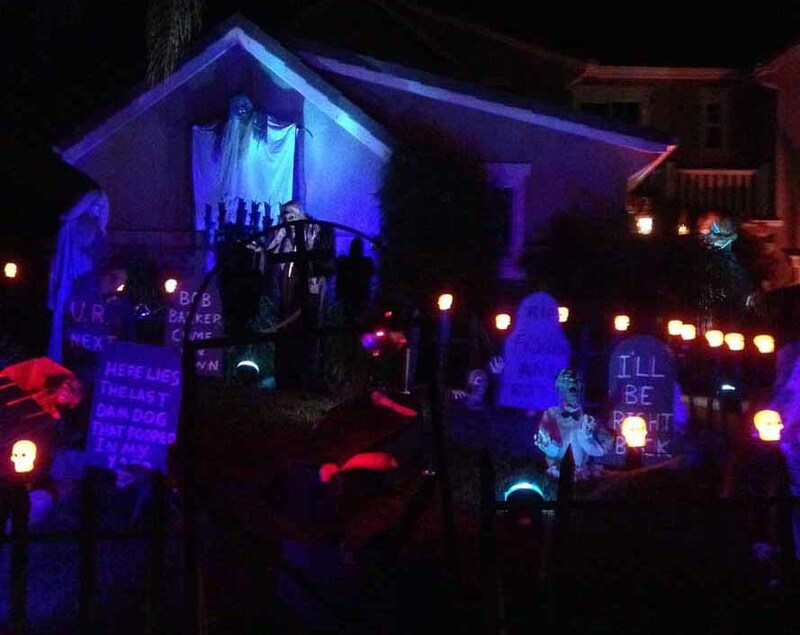 The lawn is packed with tombstones, lights, ghosts and skeletons. Mourning Rose Manor is worth a drive-by if you live near Simi Valley. And lest we forget to warn you: watch out for the giant spider guarding the front door! The last careless trick-or-treater wound up cocooned above the porch. This kid-friendly haunt has had its lights on since October 10, when we drove by after attending the opening night reception of October Shadows VII. More decorations may be added later, and complete lights and sounds will be in operation only on October 26, 27, and 31, but why not stop by for an early preview? Spider-Lights will distribute candy on Halloween Night from 6-10pm. Note the glowing spectre in the window. 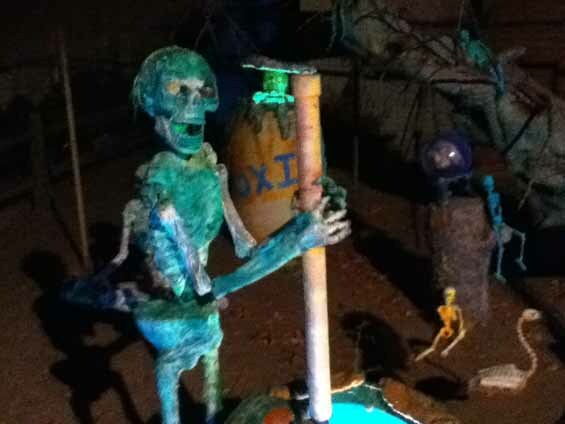 This nifty little Halloween yard haunt, which made its debut in 2011, eschews crude shocks. The display consists of tombs, static skeletons, ominous but subtle music, and some beautifully atmospheric lighting. There is also a haunted window, featuring a spectre who passes back and forth and irregular intervals, occasionally pausing to look out at the living. The Van Oaks Cemetery was in operation when we stopped by last night, but more effects and lighting may be added for the final week of October. 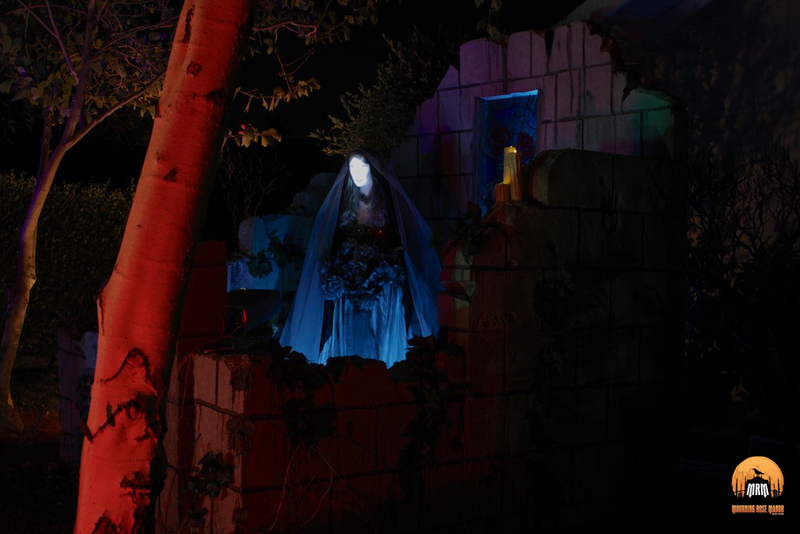 This amateur Halloween haunt – which has been in operation several years – features scary decorations, a few animatronics, music and sound effects. 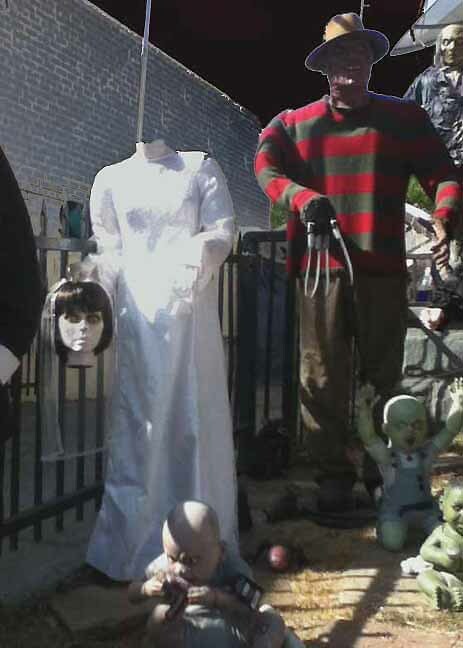 The modest front yard is packed with is packed with mannequins of Freddy, Jason, and Michael Myers, not to mention Frankenstein, Nosferatu, and Regan Teresa MacNeil. Decorations were up when we stopped by on October 22. On Halloween Night, the owners dress in costume to scare trick-or-treaters from 7pm till they get tired. Though not as elaborate as some of our favorite yard haunts, the Western House of Darkness is a Halloween oasis in the desert of the West Adams district of Los Angeles. Though intended as a neighborhood event rather than a tourist attraction, the Western House of Darkness is worth a drive-by, especially if you happen to be in the area. A new haunt (to us at least) in on Via Del Lago in Newbury Park. Photo by William Greca. 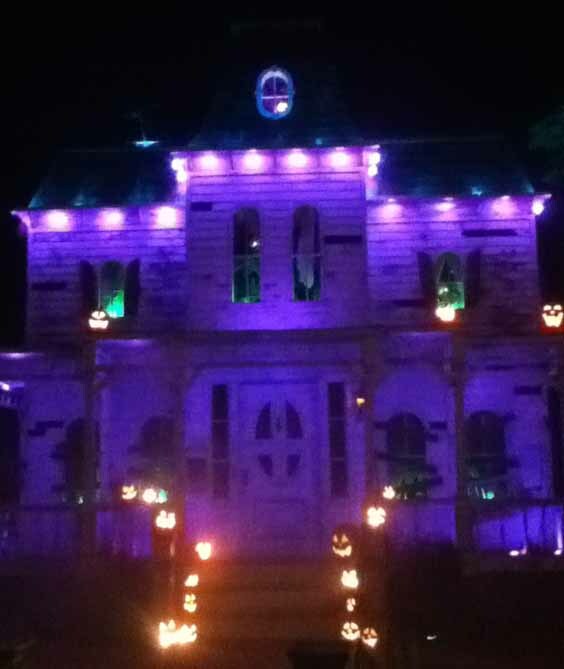 We recently heard of a nifty home haunt on Via Del Lago in the Dos Vientos area of Newbury Park (not far from the Reign of Terror Haunted House in Thousand Oaks). 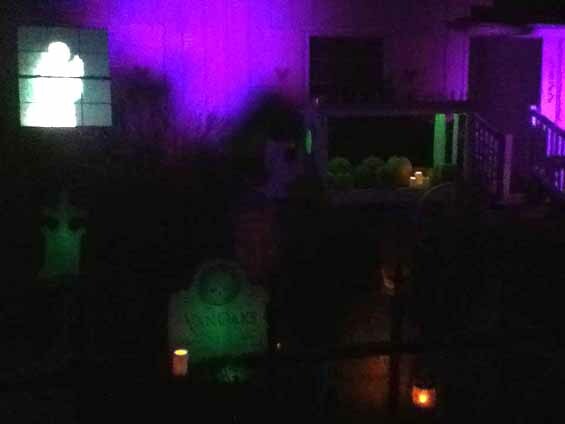 This unnamed haunt may or may not feature a walk through maze, but the yard decorations are up and ready for viewing. We hope to see this one for ourselves sometime before October ends. Meanwhile, reader William Greca was kind enough to send us this photograph. Finally, we are not sure whether the Halloween Graveyard on Katherine Avenue in Sherman Oaks is still in operation. We have not heard from them , and their web presence is practically non-existent (a single-page advertising flier from three years ago). This modest, kid-friendly yard haunt was still haunting when we drove by in October 2013, so we assume it will probably be back for this Halloween, but we have not had a chance to drive by and confirm. Since initial posting, this article has been updated with an entry on the Western House of Darkness, and the listing for the Newbury Park home haunt has been edited and augmented with a photograph.